Choose one of the most reliable minibuses available through our car rental services in Bucharest and Otopeni: Volkswagen Transporter, which can be yours for 45 euro/day. Volkswagen Transporter takes safety to a whole new level, having a number of advanced features: ESP system, Side Assist system, RKA system for tire pressure monitoring and electric mirrors. Because we want our loyal customers to know they’re appreciated, we offer you a 10% discount, based on your membership card, as well as a full gas tank and all the car insurances included (RCA and full CASCO). Through our car rental services, our client will be rewarded with more benefits than any other car rental company could offer. In addition, we do not impose a limit of kilometers and we guarantee to deliver your car for free, anywhere in Bucharest. 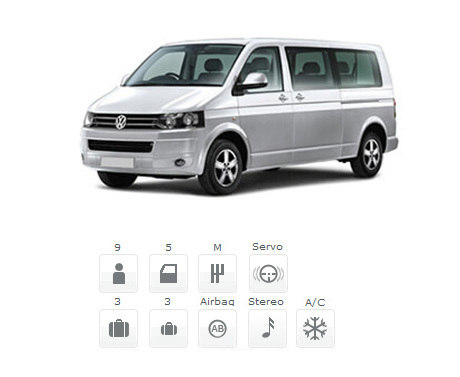 Volkswagen Transporter is the best option for minibus rentals, ready to take you and your family and/or friends to your destination, at a competitive price. It is the ideal minibus for vacation trips or teambuildings.